I was having a discussion with a friend this week about my first Saturday job in our local village greengrocers and florist (small family business). In any given week could be lugging sacks of potatoes about, bagging up carrots, serving customers on the till but my most favourite part was working in the florists section making up bouquets for passing customers. I became pretty adept at throwing a few flowers, a bit of foliage and some gypsophela together into a presentable arrangement, wrapping it in plastic and adding some trimmings. I had no idea which flowers were which but had a good eye for colour. I was also fascinated the first time I saw ribbon scored with the edge of the scissors to create the decorative curls! One of the best parts of working in the florists though was putting together a gorgeous arrangement for a special birthday gift or watching the men (it was always the men... *sigh*) run in either very, very early or very, very late to pick up a forgotten anniversary or birthday gift. It sounds stereotypical but it's so true. I sometimes wish we got extra payment for speed arrangements. I moved away eventually but returned to the very same florists when we were planning mum's funeral. We had said "no flowers" and wanted donations to go towards a much-needed machine at the hospital that treated mum but my sister and I also wanted our children (five in total) to find special gifts for her so we let them loose and asked them to pick their favourite flower. The age range of the children was between 2 and 13 and each flower that they picked represented them perfectly; a great big sunflower, a perfect white lily, others that I still didn't know the name of... but each one was matched with plastic and ribbon and the children wrote their own cards. Personal, pretty, perfect. Flowers are such an intimate gift - so many ways to get it right, so easy to arrange and something that brightens up the room immediately. 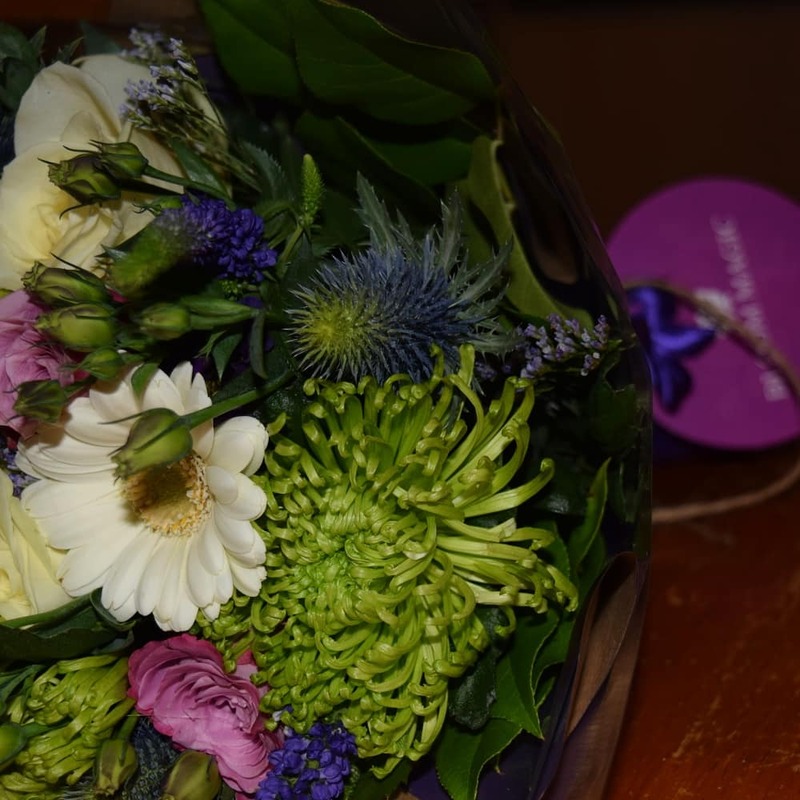 So when you can send or receive a beautiful bouquet direct to the door with minimum fuss and at reasonable prices, it's a gift that is very special. And that's why I loved working with Bloom Magic recently. The company was founded in Dublin and focused initially on the Irish market but they've recently launched their services in the UK. Their website is broken down in to "collections","occasions" and "price", making it really easy to navigate and find that special arrangement for your loved one. They also have seasonal offerings and the bouquets come with a flower care guide that provides you with plenty of tips to help your flowers last as long as possible (the bouquet in the pictures was one that I received from Bloom Magic and it lasted over two weeks!). Typically, I can count on one hand the amount of times that my husband has bought me flowers... FIVE!! When he first met me, after the birth of each child and then after a big operation. So I'm leaving this blog post open on my laptop as a HUGE hint and also, every time this song (the Ukulele Orchestra of Great Britain version is my absolute favourite) comes on the radio, I sing it at him. Loud!